consequences, the Israeli cabinet and military elite were fully aware of it all the way along. What happened yesterday wasn’t just a pirate terrorist attack. It was actually murder in broad day light even though it happened in the dark. A spokeswoman for the flotilla, Greta Berlin, said she had been told ten people had been killed and dozens wounded, accusing Israeli troops of indiscriminately shooting at “unarmed civilians”. But an Israeli radio station said that between 14 and 16 were dead in a continuing operation. “How could the Israeli military attack civilians like this?” Ms Berlin said. “Do they think that because they can attack Palestinians indiscriminately they can attack anyone? But an Israeli military spokeswoman said that there had been a planned and organised attempt to “lynch” the boarding party. She said the activists were armed with knives and guns. The Israeli government’s handling of the confrontation was under intense international pressure even as it continued. The Israeli ambassador to Turkey, the base of one of the human rights organisation which organised the flotilla, was summoned by the foreign ministry in Anakara, as the Israeli consulate in Istanbul came under attack. One Israeli minister issued immediate words of regret. “The images are certainly not pleasant. I can only voice regret at all the fatalities,” Binyamin Ben-Eliezer, the trade and industry minister, told army radio. But he added that the commandoes had been attacked with batons and activists had sought to take their weapons off them. “The flotilla’s participants were not innocent and used violence against the soldiers. They were waiting for the forces’ arrival,” they were quoted by a news website as saying. But in the early hours of this morning local time commandoes boarded from helicopters. The activists were not carrying guns, but television footage shown by al-Jazeera and Turkish television channels show hand-to-hand fighting, with activists wearing life-jackets striking commandoes with sticks. The al-Jazeera broadcast stopped with a voice shouting in Hebrew: “Everyone shut up”. It was attacked [?? how can this be when the attack is done by Israelis!!] by the head of the Hamas government in Gaza, Ismail Haniyeh. “We call on the Secretary-General of the U.N., Ban Ki-moon, to shoulder his responsibilities to protect the safety of the solidarity groups who were on board these ships and to secure their way to Gaza,” he said. Turkish television meanwhile showed hundreds of protesters trying to storm the Israeli consulate in Istanbul. The incident will be particularly damaging for Israel’s relations with what had been seen as its closest ally in the Muslim world. “By targeting civilians, Israel has once again shown its disregard for human life and peaceful initiatives,” a Turkish foreign ministry statement said. “We strongly condemn these inhumane practices of Israel. Israel’s closest ally Washington described the loss of life as a “tragedy” on the eve of talks between President Barack Obama and Prime Minister Benjamin Netanyahu. “The United States deeply regrets the loss of life and injuries sustained and is currently working to understand the circumstances surrounding this tragedy,” a White House spokesman said. Tens of millions of people are becoming aware of the growing tyranny of the global financial elite. Yet millions of those same people willingly enslave themselves to those very same financial powers. So how is this happening? It is called debt. The financial powers of the world use it to enslave individuals, corporations and governments. For thousands of years humanity has been taught the proverb that “the borrower is the servant of the lender”, and yet today hundreds of millions of people around the globe willingly have run out and have made themselves servants of the money powers. You see, when you borrow money from a financial institution, you not only have to pay that money back, but you also have to pay a significant amount of interest. In fact, often the interest ends up being much more than the principal of the loan. Thus the borrower ends up devoting a great deal of his or her labor to earning money for the lender. Certainly there are times when it is necessary to borrow money. But what Americans have been doing over the last 30 years goes far beyond “necessary” borrowing. In fact, the massive debt binge of the last three decades has been nothing short of a huge percentage of the American population entering into willing financial enslavement. Do you think that is an exaggeration? Just consider the chart below. The word “insanity” does not even begin to describe the growth of household credit in the United States over the last 30 years…. So why is debt so bad? Well, there are a lot of reasons. Debt strips you of your freedom and slowly drains you of your wealth. It puts the fruits of your labor into the pockets of others. Getting others enslaved by debt is how the most powerful financial institutions in the world got so dominant. It is one of the most profitable ways of making money ever invented. What many people don’t realize is just how much interest they end up paying on some of their debts. For example, if you go to mortgagecalculator.org, you can calculate the amount of interest that you will pay over the life of your home mortgage. According to that calculator, someone with a $250,000 mortgage at an interest rate of 6.5% over 30 years will end up paying over $300,000 in interest before it is all paid off. So when those 30 years are over, you have bought a house for yourself and you have also bought a house for the bankers. But there are many forms of credit that are far worse than mortgage debt. Just look in your wallet. Do you have a credit card in there? If so, and if you carry a balance each month, then you are “feeding the monster” and you have financially enslaved yourself. But you are far from alone. According to the United States Census Bureau, there are approximately 1.5 billion credit cards in use in the United States. In fact, 78 percent of American households had at least one credit card at the end of 2008. So it is a rare person who does not have at least one credit card. 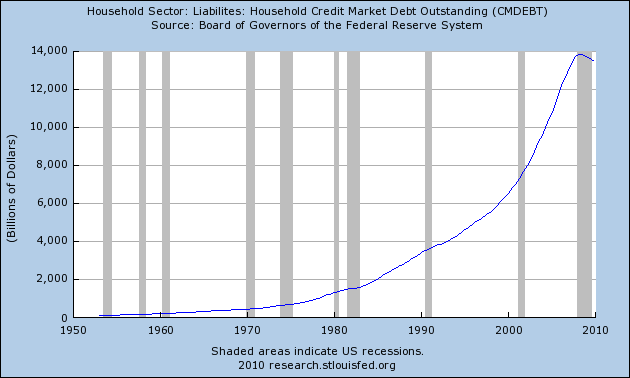 But not only do the vast majority of us have credit cards, we are using them at unprecedented rates. At the end of 2008, the total credit card debt piled up by American consumers was more than 972 billion dollars. That is an amount that is greater than the GDP of the world’s 122 poorest nations combined. So why is credit card debt bad? Well, because it can drain your wealth faster than almost any other method ever created. For example, according to the credit card repayment calculator, if you owe $6000 on a credit card with a 20 percent interest rate and only pay the minimum payment each time, it will take you 54 years to pay off that credit card. During those 54 years you will pay $26,168 in interest rate charges in addition to the $6000 in principal that you are required to pay back. That is before you include any fees or penalties you might accumulate along the way. Do you really want to repay over $30,000 for a $6,000 purchase? They are getting insanely wealthy off of your financial enslavement. It is time to get out of debt. One of the most common financial questions that people ask today is what they should do with their money. Well, the answer to that question is a lot more obvious than people may think. After purchasing all of the food and supplies that are needed for the hard times that are coming, people need to get out of debt. There are very, very few investments that will add to your wealth faster than debt is draining it. So don’t let your money sit there and earn a couple of percentage points if you are carrying any debt that you can easily pay off. Paying off debt will reduce your living expenses and will give you much more flexibility. It will also put you in a much better position to weather the very difficult financial times that are coming. When you get into more debt, you are playing the game that the Federal Reserve, JPMorgan Chase, Morgan Stanley, Citigroup, Bank of America and Goldman Sachs want you to play. There are always going to be financial predators that are ready to drain your wealth. But you don’t have to play that game. Work to get yourself free. You will be glad that you did.